Value-priced, entry-level peroxidase substrate for enhanced chemiluminescence (ECL) that directly replaces costlier products without the need to re-optimize conditions. 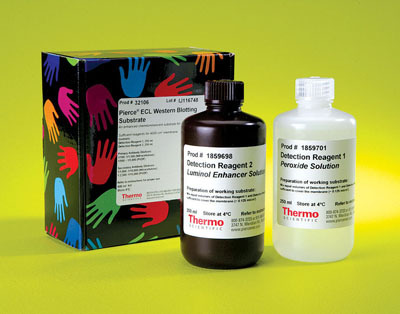 Pierce ECL Western Blotting Substrate provides reliability and performance equivalent to other standard enhanced chemilumescent (ECL) substrates for detection of horseradish peroxidase (HRP) enzyme activity, yet costs much less. 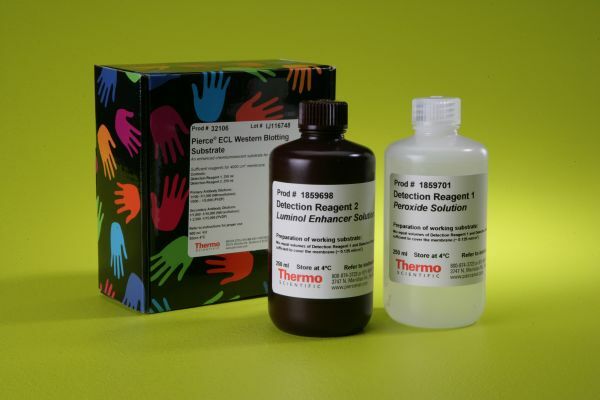 Because the luminol and peroxide reagent-formulations are identical to other commercially available substrate products, one can switch to Pierce ECL without needing to optimize probing conditions or incubation protocols. Simply switch to Pierce ECL and save a bundle.